While perusing the amazing dried fruit display at the new Fairway Market on East 86th street between 2nd and 3rd Avenues in Manhattan NYC, I spotted these gem-like golden raisins. http://www.fairwaymarket.com/ (There are many locations in the city and in New Jersey.) They inspired me to create a cookie recipe that would highlight their beauty, texture and flavor. Oatmeal Raisin cookies are a healthy classic but their typical color would blend too much with the golden fruit. I was looking for contrast and drama. I remembered that my photographer friend, David, had been telling me lately how much he loves including molasses in his homemade ice cream and other cooking endeavors because of its rich flavor. I realized that adding it to a cookie recipe would make the color and moistness a perfect backdrop for the juicy yellow raisins as well as adding caramel notes of flavor. After mixing up a batch of a new cookie recipe I typically cook off two cookies to determine cooking time and temperature, and to evaluate the appearance, texture and flavor. After the first try with this recipe, I decided that I wanted them to spread out more to become thinner and flatter. I added more fat and liquid (egg) to the recipe. I also wanted to brighten the appearance of the cookies with a more jazzy look. I added dried cranberries both for color and flavor, not to mention their major health benefits. 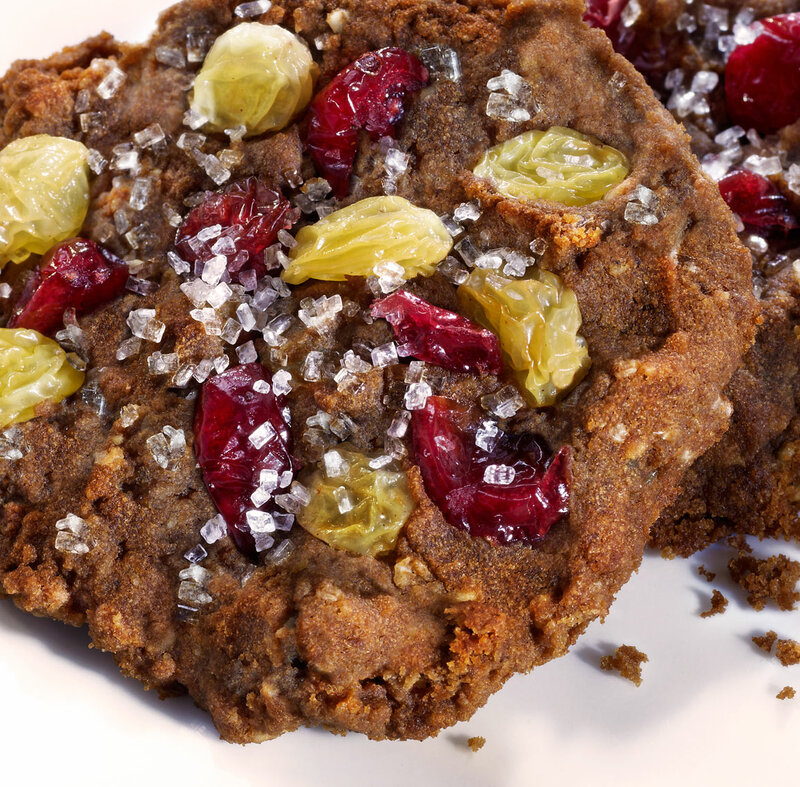 http://www.whfoods.com/genpage.php?tname=foodspice&dbid=145 http://www.cranberryinstitute.org/healthresearch.htm The tartness of the cranberries are perfect for balancing the richness of the cookie base and the sweetness of the raisins. The finishing touch was sprinkling a pinch of bright white sanding sugar onto each cookie before baking, adding visual dazzle and textural crunch. I have been using coconut products lately in baking and cooking for their many delicious and healthy properties. Instead of repeating myself here, I invite you to see some of my other posts for more details on the subject, including where to find the ingredients. Place the raisins and dried cranberries in a small bowl or glass liquid measuring cup, and just cover them with boiling or very hot water to soften. In a large bowl, using an electric mixer or a wooden spoon, cream together the sugars (reserving the sanding sugar for garnishing) and fats until homogenous. Mix in the eggs until smooth. In a separate medium sized bowl, whisk together the flours and other dry ingredients, including the rolled oats, but not the sanding sugar. Mix the dry ingredients into the wet ingredients until homogeneous, but not the moistened dried fruits. Drain the softened dried fruits, reserving the liquid to flavor your favorite beverage. Fold the drained fruits into the the cookie dough, reserving about 3/4 cup for topping the cookies. Form the cookies into tablespoon sized balls and slightly flatten them onto the parchment lined baking sheets with your fingers. Be sure to leave enough space between the cookie dough to allow for spreading, at least an inch or so. Garnish them artfully with the reserved fruit, slightly pressing the fruit into the dough so that it sticks well during baking, then sprinkle each cookie with a bit of sanding sugar. Bake the cookies for 8-10 minutes until the edges are browned. Let the cookies cool for at least ten minutes before removing them to a cooling rack with a metal spatula. After they are cooled completely, enjoy immediately or store them in a covered container. If you would like to make the recipe gluten and dairy free, replace the butter and all-purpose flour with coconut oil and coconut flour. The resulting cookies will be a bit more crumbly but equally delicious.